Bulgaria has been ranked again at the EU bottom in Transparency International's newly published Corruption Perceptions Index (CPI) for 2013. However, for the second year in a row, Bulgaria is not the most corrupt among the EU Member States, according to the Berlin-based body, which has ranked the country 77th out of a total of 177 with 41 points. This is the level from 2012. Senegal and Tunisia are also 77th. Greece with 40 points is 80th and the most corrupt in the EU, but is has moved up from last year's 36 points and 94th spot. 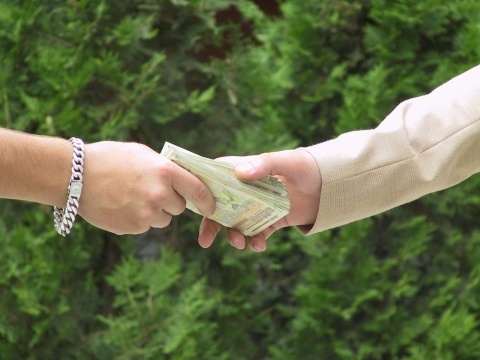 Bulgaria is the second most corrupt and Romania is ahead of Bulgaria with its 43 points and 69th spot (66th in 2012). Bulgaria is behind countries like Bhutan, Puerto Rico, Brunei, Cape Verde, Dominica, Costa Rica, Oman, Cuba, Ghana, Saudi Arabia and Kuwait. The report explicitly notes that any score below 50 points is problematic. The Corruption Perceptions Index ranks countries and territories based on how corrupt their public sector is perceived to be. A country or territory's score indicates the perceived level of public sector corruption on a scale of 0 - 100, where 0 means that a country is perceived as highly corrupt and 100 means it is perceived as very clean. A country's rank indicates its position relative to the other countries and territories included in the index. Transparency International's Corruption Perceptions Index 2013 offers a warning that the abuse of power, secret dealings and bribery continue to ravage societies around the world. "More than two thirds of the 177 countries in the 2013 index score below 50, on a scale from 0 (perceived to be highly corrupt) to 100 (perceived to be very clean). "The Corruption Perceptions Index 2013 demonstrates that all countries still face the threat of corruption at all levels of government, from the issuing of local permits to the enforcement of laws and regulations," says Huguette Labelle, Chair of Transparency International. One of the main conclusions of the report is that the poorer a country, the higher and most wide-spread corruption is. Syria, which is shaken by civil war, Libya and Mali, involved in strong military conflicts in recent years, are among the countries that have made the greatest setback from their previous position, showing that corruption is also and often accompanied by the breakup of a State. The Corruption Perceptions Index is based on experts' opinions of public sector corruption. Countries' scores can be helped by strong access to information systems and rules governing the behavior of those in public positions, while a lack of accountability across the public sector coupled with ineffective public institutions hurts these perceptions. "2013 results show that corruption within the public sector remains one of the world's biggest challenges," Transparency International said, "particularly in areas such as political parties, police, and justice systems. Public institutions need to be more open about their work and officials must be more transparent in their decision-making. Corruption remains notoriously difficult to investigate and prosecute." "Future efforts to respond to climate change, economic crisis and extreme poverty will face a massive roadblock in the shape of corruption," Transparency International warns. Since 2012, TI uses an approach that provides greater clarity on how the index is constructed, making it easier to trace how the data from the sources are rescaled for inclusion in the Index. The updated method also means that a country's Corruption Perceptions Index score will better capture changes in perceptions of corruption in the public sector of that country over time.